Photo courtesy of Infocux Technologies via Flickr Creative Commons. The mobile takeover of web browsing activities has grown significantly over the past few years. In the 2013 Q1 study conducted by the Ecommerce Monentate, mobile browsing now represents 25% of all the internet traffic, with smartphones and tablets as the primary medium being used. As mobile browsing increases, it is imperative for businesses and organizations to provide their clients with responsive websites that adapt to multiple mobile screens and operating systems. As one of the core components of digital marketing, it can help your business increase conversions targeting a much wider audience and taking in more online traffic. Read on below as we lay out the benefits of designing a responsive website for your organization. Try to simultaneously input a specific URL on a computer and a smartphone browser. If the page being displayed on the mobile device appears and behaves similar to the layout on the PC, then it is a non-responsive site. This means you still have to zoom in and out the page several times to be able to view its content and access its features. 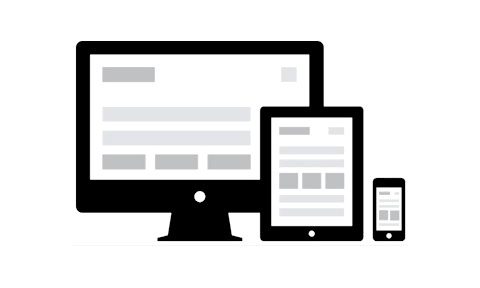 A responsive website adapts to any screen size and presents all its elements and information accurately. Google, the flagship search engine, states that a “responsive web design is its recommended mobile configuration, and even goes so far as the industry’s best practice.” Since responsive sites only require a single URL and the same HTML 5 code source, it becomes easier for the search engine to crawl on it, organize its content, and index its pages using its algorithm. This practice will result in an increased page rank and traffic. Android device users have the ability to add a widget of their favorite sites straight onto their phone’s home screen or use a third party application to do the trick. In the case of HTC One, we’ve learned from the HTC One on O2 page that it has a “BlinkFeed” application, a magazine-style RSS reader that displays content from social networks, news feeds, and web pages. It constantly refreshes based on the frequency of posts coming from the aforementioned sources. With a responsive web design, it can accommodate the configuration of the widgets and third party apps by displaying your site’s content without delivering a mediocre quality (comprised of minuscule interface, unrecognizable images, and miniature texts). It can also increase your site’s conversation rate, since satisfied users are most likely to subscribe to your site through RSS readers. We all know that your site’s content is the ultimate king and its ability to be discovered is the foremost success metrics for your business. But, as suggested by Knowledge Ridivi, it is “the user experience that enables visitors to consume content on any website anytime, and through the device choice of their preference.” When creating a responsive site design, you are also promoting an optimal user experience whether they’re using a SmartTV, a tablet, or a smartphone. In most cases, if visitors are browsing your site using a smartphone or tablet, and it isn’t responsive; they will most likely leave and abandon your online presence forever. In an article written by Christopher Mathieu on Hubspot, he reiterated that people are easily frustrated if “they hit your homepage and still have to pinch to zoom or scroll around to find a search box.” They will move on to something else – hopefully, not to your competitors. Designing a website with HTML 5 enables your site’s content to adapt to mobile and PC browsers and saves you the cost of making multiple or duplicate “sites” for your website. It also cuts down the time for updating and maintaining multiple URLs. It’s true that the coding process for a responsive site is more challenging for developers, you might need a separate team to handle it. But, in the long run, it will pay off knowing that you’re ahead of your competitors. Why create a responsible web presence? It gives your business a competitive edge. With this venture, you are giving current and potential customers exactly what they are looking for – a great user experience, friendly content regardless of their device(s), and a stronger and unified webpage. For more insights and tips on how you can build a responsive website, visit the services page at Ofamfa®, where you can skim through our new media design, media production, and ICT Consultancy services. About the author: Jennifer Birch is a tech correspondent specializing in web design, mobile devices, and business solutions. Her portfolio includes working for high-profile advertising agencies and commercial organizations in the United Kingdom. She finds joy in sharing her knowledge and experiences to those newbies in the industry. Add her to your Google+ circles.